A couple of friends and I left our babies at home to hit up a wine tasting at a local art and antiques market Friday night. In addition to a good buzz and a full belly, I left with a ton of inspiration for stocking my etsy shop this holiday season. I can’t believe it’s almost November and this is the first I’ve thought of it! 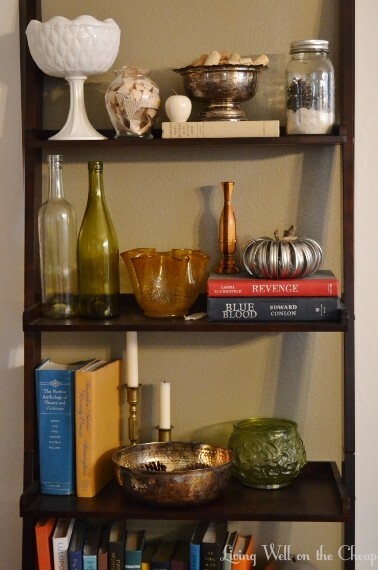 In years past I’ve made it my goal to have a wide range of interesting gifts and decor listed by Thanksgiving and I’d love to keep it up. That means that I’ll be busy busy busy the next few weeks shopping, cleaning, photographing, and pricing my pretties! And after introducing a couple of handmade items last year I think I’m ready to add a few more. I spent the weekend brainstorming a list of items I’d like to include if I can find/make them in time. And while I don’t have any specific items to share with you yet, I thought it’d be fun to let you in on the general feel I’m going for. I’m hoping to bring in more of the brass, silver, wine corks, chalkboard, and book pages that I’ve used in the past, but this year I want to add some new textures in leather, wood, mother of pearl, and linen. Also expect to see plenty of gold and a generous dose of glitter. I’ve been wanting to learn embroidery for a while and after seeing some really cute modern samplers at this shop I’m inspired to finally give it a try. I’m also thinking of doing a few things with maps–are people still into maps? I haven’t worked with them much before but I saw some new uses for them on Friday and am now kicking myself over the vintage atlas I once passed on at an estate sale. I’ll be hitting up estate sales, thrift stores, and even eBay all month so expect to see some upcoming posts about my finds. I hope you each had a wonderful weekend! Ours was full and fabulous–wine tasting on Friday, tailgating for LSU’s homecoming on Saturday, and a birthday party and fall festival on Sunday. We spent lots of time with family and friends and I even burned off all those calories consumed at the wine tasting by pushing a stroller all around campus the next day. Thank you all for reading, and happy Monday! I made Jack’s Halloween costume yesterday! It cost me almost nothing and was super easy. 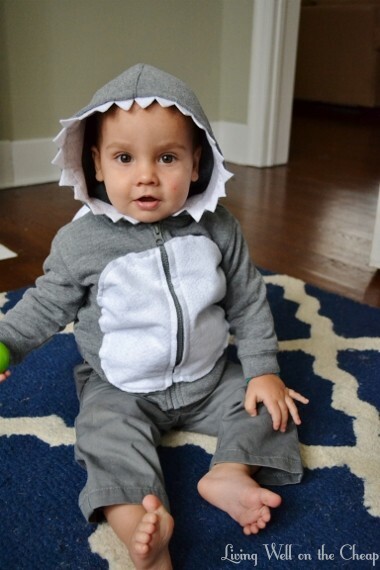 Please tell me it’s obvious that he’s a shark. 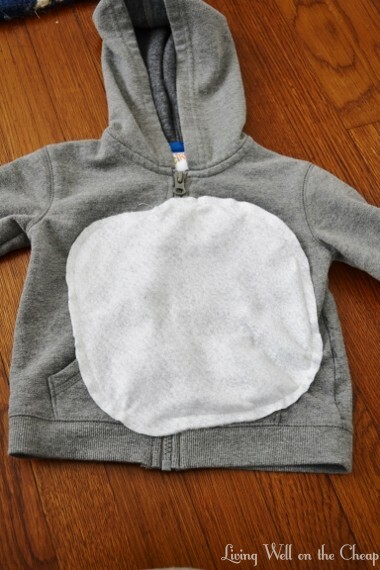 I started out with this gray hoodie from Target ($9) and a few sheets of white felt that I already had (originally $1.25 total). The sheet that already had a piece cut out was thinner and softer and, according to the sticker on the back, only 25 cents. The other two were more stiff, had glitter on one side, and were 2/$1. They’ve all been hanging out in my craft stash for the better part of three years, as you can see by the label! 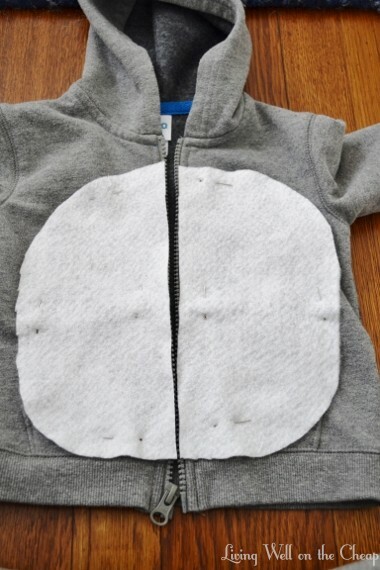 First, I cut an oval out of the soft felt to serve as the shark’s belly. 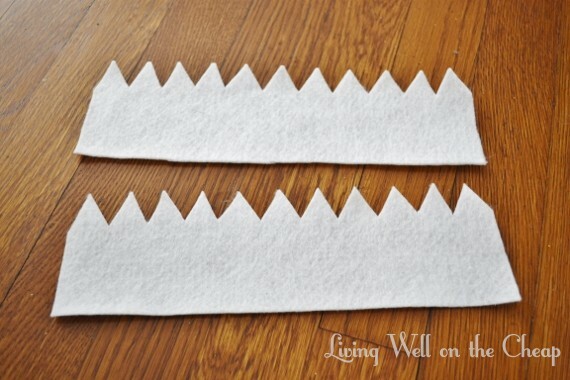 Then, I cut two strips from the stiff felt and used a sharp pair of scissors to cut out triangle shapes. I trimmed them to length and, voila, shark teeth. 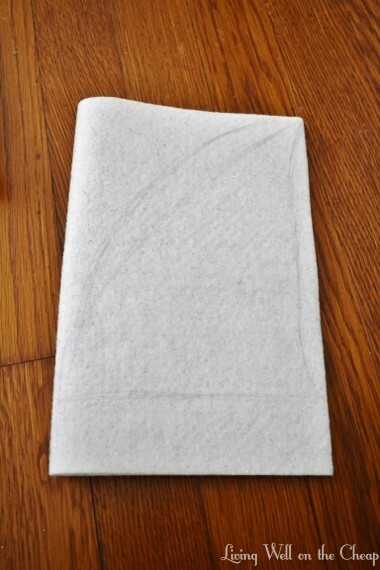 I folded the remaining sheet of felt in half (glitter sides together) and sketched out the shape of a shark fin. I was a little nervous about getting it right so I googled it and found a few examples online to emulate. 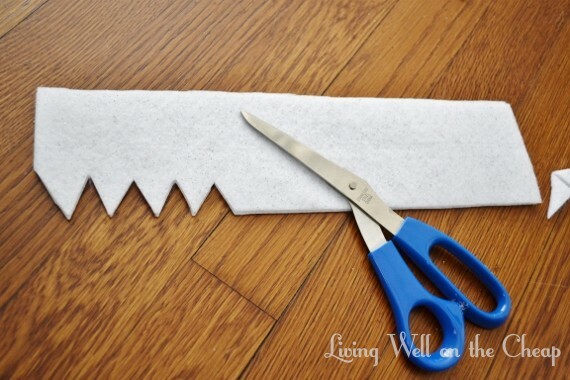 Once I’d cut out my fin I actually trimmed it down to a considerably smaller size, so you could definitely get a much bigger fin out of one sheet of felt if you felt so inclined. I top-stitched around the two sides of the fin, leaving the bottom open and stuffing the inside with a few scraps. 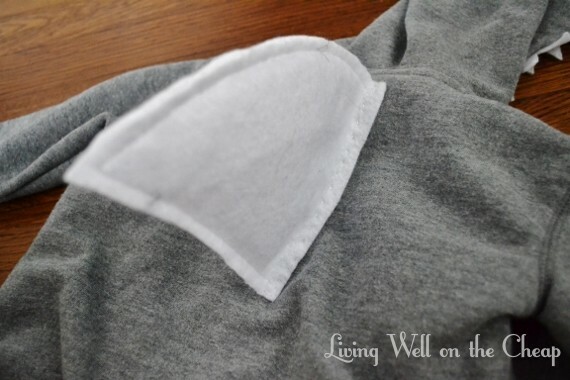 I actually stopped my stitches a few centimeters from the bottom of the fin so that the two sides could splay out and attach to the hoodie (this may make more sense when you see it attached). 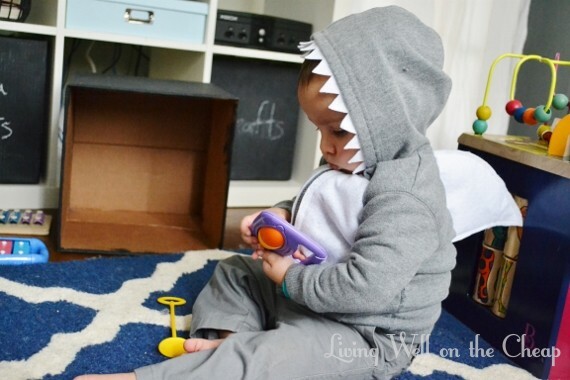 If you don’t have a sewing machine you could totally stitch the fin up by hand or even use glue. 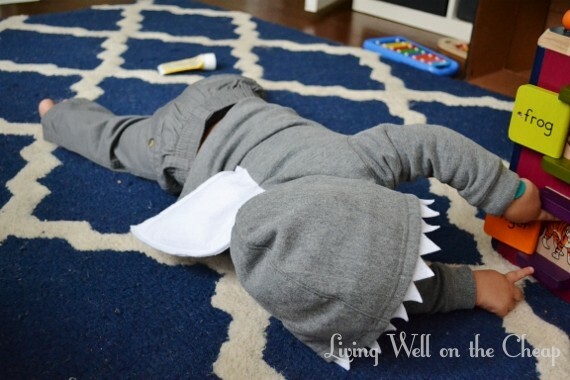 Next step: sew on the shark belly. My first attempt left something to be desired. 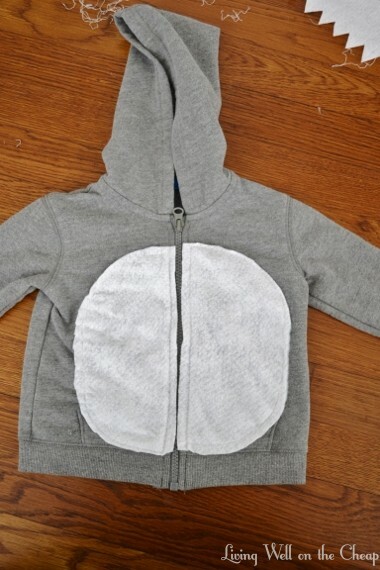 My idea was to sew on the belly, then cut a slit down the middle to accommodate the zipper. But when I saw how lopsided things had gotten I decided to try again with pins holding it in place, in which case I might as well go ahead and cut the zipper free right then. 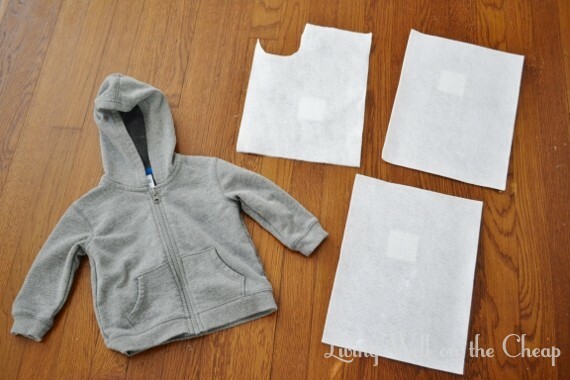 It was a lot easier to sew with the hoodie unzipped. I actually laughed out loud when I saw what it looked like the second time. I mean, come on! What did I do wrong this time? But no worries, a little strategic trimming around the edges got things looking much more symmetrical. 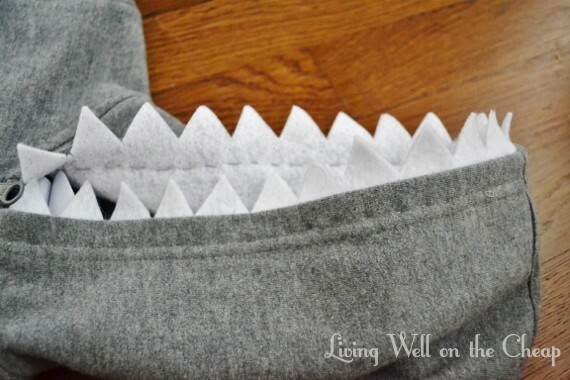 I’d had so much trouble with the belly that I decided to stitch the teeth and fin by hand. Bonus: this way I didn’t have to re-thread my machine with gray thread. This was an easy task to knock out while watching The New Girl with Nick after Jack was in bed. 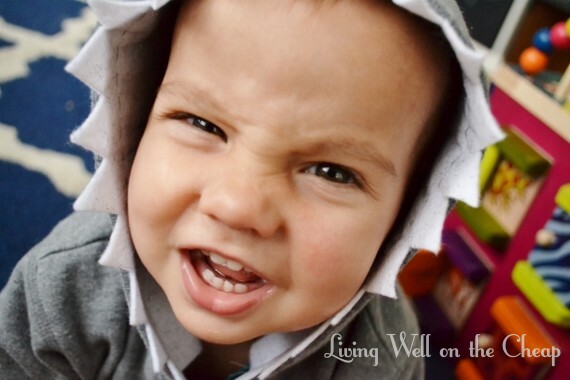 I was thrilled when I saw how cute it looked on Jack! Rarely does a project actually turn out like I’d hoped, so this is a special treat. I paired the hoodie with a pair of gray pants that we already had, but I think it would look just as cute with jeans, sweatpants, whatever. As you can see, it’s plenty comfortable for playing. When he lays on his back the fin just flips over to the side. 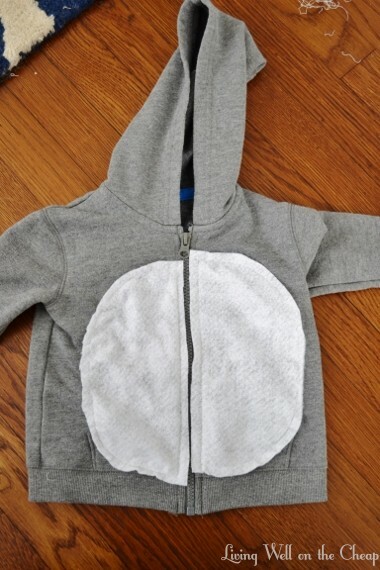 Using a gray hoodie as the basis for the costume made it really easy to DIY. I’ve had this on my to-do list for weeks and kept putting it off, thinking it would take me a whole afternoon, but even with the trouble I had sewing the belly on it still took me under an hour total (including the hand-stitching I did in front of the TV). I’m thinking of ripping out the stitches and continuing to use the jacket as a regular piece of clothing after Halloween has come and gone, but I bought it in size 12 months and I’m not sure how much longer it will fit him, so we’ll see. I just can’t get over how stinking cute he looks in it. 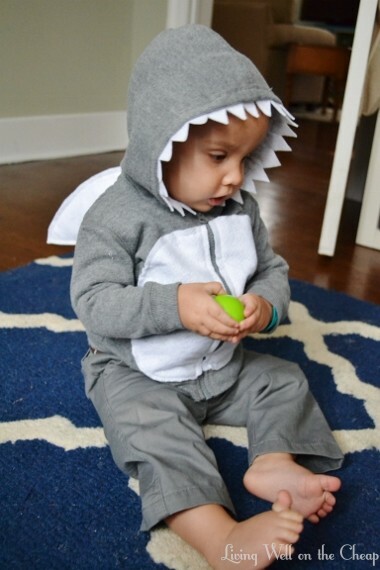 This is a costume that I think would work equally well for boys and girls (just add some pink or glitter if it’s not girly enough for you, but I tend to prefer gender neutral stuff anyway). I always hate the idea of spending money on a costume that is poorly made, probably uncomfortable, and will never be worn again, so this one’s definitely a winner in my book! 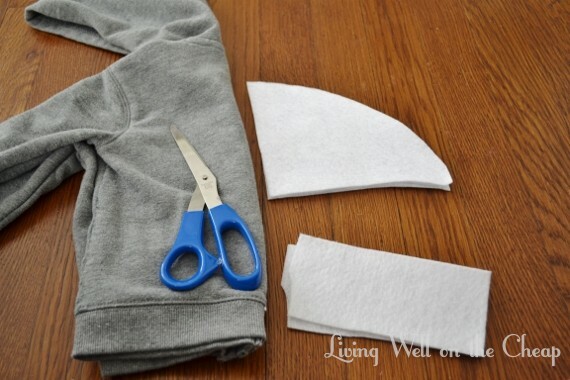 If you’re not much for sewing you could definitely use hot glue or some other adhesive, but stitches are easier to rip out so that the hoodie can resume normal use. 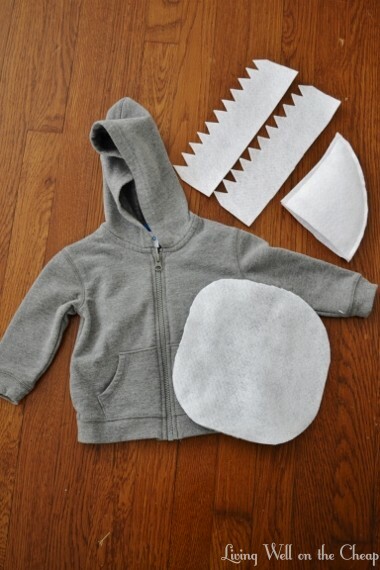 You could use the same concept (hoodie + felt or other embellishments) to make all kinds of stuff, like a cat, monster, dinosaur, little red riding hood, unicorn, frog, etc.. The possibilities are endless! I have never been one for decking my entire house in seasonal decor. I’m totally not knocking those who do, I’m just not nearly organized or energetic enough to manage that kind of thing year round. Even my Christmas decorations have been on the understated side the last two years. But I do like to change up a few things here and there to acknowledge the time of year, even if I’m the only one who notices. 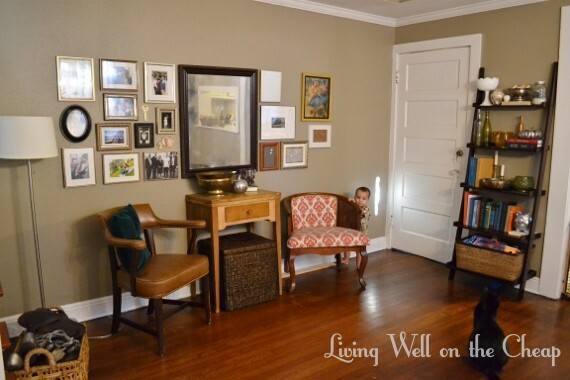 All of my “fall decor” can be spotted in the photo below (pantsless baby and Halloween cat included).You can see also that I’ve been making some progress in general decorating–I got a storage ottoman to slide under the sewing table and hung a few more frames on the wall. On the sewing table: a metal pumpkin that I bought at my first ever estate sale and a short cylinder vase full of pinecones I found in my parents’ yard. 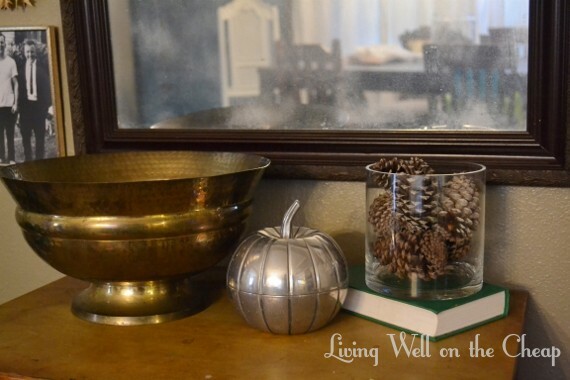 On the bookshelf: the mason jar lid pumpkin that I made last year and a couple of leftover pinecones tossed into the silver bowl that was already there. The cylinder vase was full but it seemed a shame to put the remaining pinecones into a drawer, so here they sit for now. 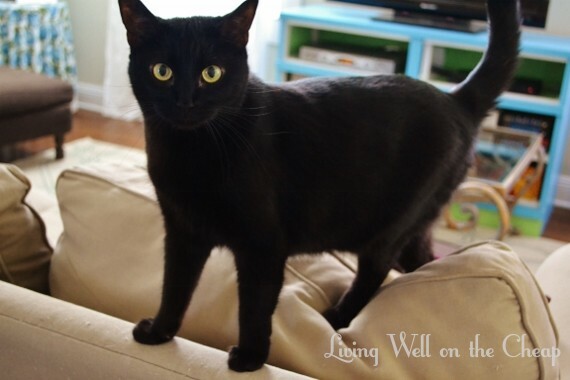 And lastly, Halloween Cat! Actually, her name is Sheila, and she’s difficult to catch on camera because she avoids Jack and Juliet (both of whom are almost always on my heels). She is very sweet and well-behaved and I love her. I don’t even have a pumpkin on my porch yet! We were going to hit up a local pumpkin patch on Saturday but since it was expected to storm all weekend we postponed, then of course the weather was gorgeous most of the time. Maybe next weekend!